I'm afriad we've had an unfortunate case of "that looks better in the bottle than on the nail". I love KBShimmer polishes. I can tell you hands down, it's my favorite indie brand. That being said, not everything from even your favorite of favorites is something you love. This polish sadly didn't work out well for me. 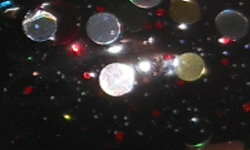 Strung Out is a black jelly base with multi colored and sized glitters mixed in. Color: I love the concept of this and how it looks in the bottle. A black background with bright large glitters is so up my alley. That being said. this just did not preform well on the nail. Formula: I really struggled with the glitters in this polish. They did not easily come on to the nail. I read that using a black creme base on this maybe better because the jelly base is sheer. I layered 2 coats over black, and I found that the glitters I did get on my nail were muted and drowned out by the following coat. My totally non-professional nail polish making opinion here is that there some balance issue with the glitter and the base. They're not meshing well together and it's causing application/appearance issues. I has a sad. Price: I paid $8.75 on the KBShimmer's website. Overall: I'm disappointed in this one. I've seen bloggers who do get this to look good. This maybe one where you have to put some extra effort in with dabbing the glitters and so forth to make it work. I'm just a casual polisher. I don't want the extra steps, that's actually why I love KBShimmer so much. All the glitters I've tried except for this one have been a breeze to apply. I still love KBShimmer to pieces, but this a miss for me. I still think it looks pretty on you, but agree that it seems like too much work. I'm with you on the casual polisher thing. Most the time, when something like this doesn't work out for me, I figure it's because I don't know how to apply glitters properly, even when I put forth the extra effort. I adore the concept of this one, too... It must be difficult to pull off colored glitters in a black base because everything you've said about this reminds me of Orly Androgynie, another "better in the bottle" color. I love the concept of it, but yeah...the execution fell short, unfortunately. Circle glitters in it are pretty. Sad to see that it didn't translate that well on the nails though. This is one of the few polishes from this collection, I hadn't picked up yet. I was almost regretting that, but seeing how it seems to be difficult to apply, I am glad it was one I skipped.